Technology is totally cray. Right this very second, I am blogging from an airplane bound for Tampa, Florida. For a nominal fee of ten bucks, I have been able to Internet the entire flight. I don’t have a general theme for this blog, so you will just have to deal with my random thoughts. I’m going to Florida for work, but managed to book a hotel right beside the mall which has a Tory Burch and a Neiman Marcus, which are unavailable to me in Pittsburgh. Yay! I really want to start planning my spring wardrobe but I am hampered by the fact that I have zero idea what is in style right now. I also would like to slim down a size (or two—yeah right) and don’t want to buy clothes if they aren’t going to fit in a couple of months. Who am I kidding? I will just end up buying a ton of cropped yoga pants. Why ruin a good thing? You know what I’m obsessing over right now? My bracelet stack. It all started a few months ago when I came across this photo on Rich Kids of Instagram. I agree. I need to stop but I just can’t seem to get the stack quite the way I want it, which is eclectic and effortless but completely stylish. I bought a new bracelet yesterday and if I’m not careful, I’m not going to be able to use my arm. The captain has just indicated we are going to begin our descent, so I’m going to put away my laptop and start my anxiety attack that will last until we land safely. XOXO. ok first of all, I have the exact same arm stacking obsession that I can never quite perfect! I also have the exact same anxiety with flying. I tell my boss or my husband, whomever has the pleasure of traveling with me that I have to have a window seat and even when we have turbulence, as long as i can see the ground, we are ok! They want to know why, so you can see us slam into the ground before we die? Now really, is that the best response for an anxious flyer? I think not! 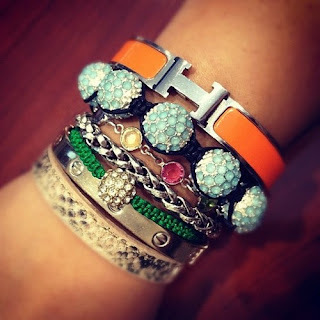 I bet GiGi could supply you with a custom made stack! I agree! Gigi is the master with the jewelry. She has some beautiful thngs. You may have inherited that talent? Who knew?? And, if it's something you enjoy, do it!